Huge protests materialised on the early hours of morning on Wednesday when two women in their 30s tried to enter the Lord Ayyappa temple. The two Kannur residents, Reshma Nishanth and Shanila Sajesh around 5 AM took the 5.5 km trek from the Pambha base camp with police protection but were stopped during their ascendancy at Neelimala which is half way around to the total journey. Earlier, the women had noted they had taken the 41-day penance and will definitely offer prayers to Lord Ayyappa. The situation got more complicated when police tried to remove the protesters in the path of the two women devotees. Finally, they had to concede to the protesters blockade and return back to the Pambha base camp. 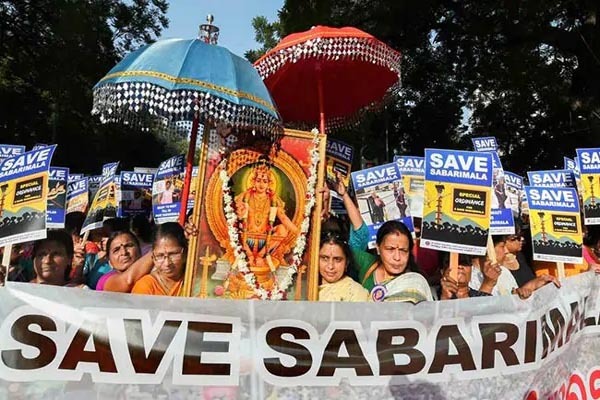 Kanaka Durga who was among the first female devotee within the menstruation age group to enter the Lord Ayyappa temple on January 2 after Supreme Court’s verdict had to face the ire of her mother-in-law and had to get treated at a hospital.